In a bowl, whisk the mayonnaise with the ketchup, relish, lemon juice, garlic, Tabasco, Worcestershire sauce, paprika and chili powder and season with salt and pepper. Let stand at room temperature for 15 minutes. In a medium saucepan of boiling salted water, cook the asparagus until just tender, 3 minutes. Drain and cool. 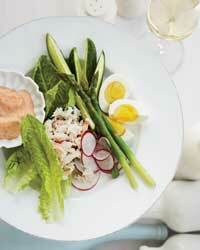 Arrange the romaine, cucumber, radishes, tomatoes, eggs and asparagus on a platter. Top with large chunks of the crabmeat and serve, passing the dressing at the table.